When you have an electric garage door you just need to push a button to open and close it without even having to get out of your car. How convenient! But what if the opener performs poorly or stops working altogether? Then you must act without delay. If the opener is performing just like before, but is much louder while working, then you are most probably faced with greater friction between the metal hardware components. This is due to dryness. What’s the solution? If your door is equipped with a chain or screw drive opener, you should start by lubricating the metal chain or rod sitting inside the rail. Apply lubricant to the areas where there is friction between the rail and the trolley too. It is best to use non-sticky lubricant that doesn’t get harder as the temperature goes down during the winter which is the norm in Connecticut. Check what the manufacturer of your opener recommends to be on the safe side. Some opener manufacturers have formulated their own lubricants. You may have overused the system. Just let the motor rest until it has cooled off completely and try running it again. If this doesn’t work, the issue could be more serious. Check to see if the unit receives power. If this is the case, you may be faced with motor failure or circuit board failure. The risk of such problems is generally very low. In such cases, the opener repair typically involves replacement of the faulty component. f you have this problem, you have to run a short investigation to find the cause of the problem. The first thing which you need to check is whether the motor is actually working. If it hums like it normally does, the problem is with the hardware. Look up to check if you have a broken spring. If this is the case, you will be able to see the two pieces hanging on the shaft or safety cable. If the springs are intact, you should inspect the trolley carriage, which normally moves along the rail, to see if it’s broken. No matter which one of the two components has come to the end of its useful life, it must be replaced. 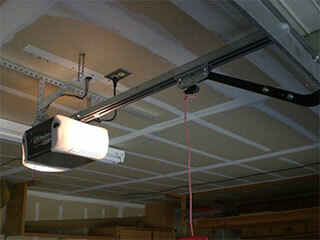 You can rely on us, at Garage Door Repair in Stamford, to eliminate this and all other opener problems. If you're in need of a garage door repair service with technicians who are nearby and eager to lend a hand, you're in luck! Whatever the issue, we'll be able to determine the source and take care of it so you're not stuck with that noisy, slow door. We're here for you! Thank you for choosing Garage Door Repair Stamford! One of our experts will be in touch soon. Feel free to browse our website for FAQ, tips and more useful information in the meantime!